One can legitimately ask oneself whether it is not sufficient, to fight against climate change, to simply wait until we run out of fossil fuels, what will automatically lead to the vanishing of the majority of our emissions of greenhouse gases. I will not develop here the fact that a massive shortage of fossil fuels, in a world that did not anticipate this stage, is probably one of the best ways to trigger a worldwide deflagration. The purpose of this page is to give a couple of figures that will help to answer this question on a “purely climatic” point of view. It therefore seems that we can’t rely on a fast depletion of fossil fuels resources to limitate our CO2 emissions in the near future : ultimate reserves allow a 3% annual growth of the fossil fuel consumption for all the 21st century. (*) If the consumption remained constant, proven reserves would allow. 4000 Gtoe if we include the additionnal reserves, which consist either of the extractible fraction of resources not yet discovered, but that should be in the future, or the reevaluation of the extractible fraction – because of technical improvements, or increase of the market prices – of known seams or reservoirs. The amount of additional reserves remains of course an object of debate. the additionnal reserves are necessary speculative. Let’s re-do the calculation while taking into account an annual growth of the consumption. We will also suppose that any fossil fuel can substitute another one (for example after oil is exhausted it’s coal that takes over) without any “losses” (in short we assume that the efficiency of machines remain the same when the fuel changes), which is of course very optimistic. For example, the loss rate to liquefy coal, what would be necessary to substitute oil by coal for vehicules, is close to 50%. It means that the energy “included” into the liquid hydrocarbon obtained from coal represents only 50% of the energy “included” in the coal if it is directly burnt, the remainder being consumed by chemical plants to convert coal into synthetic liquids. 115 years (instead of 400 with no growth included) to consume all proven and additionnal resources (agregating oil, gas, and all types of coal ; see below). 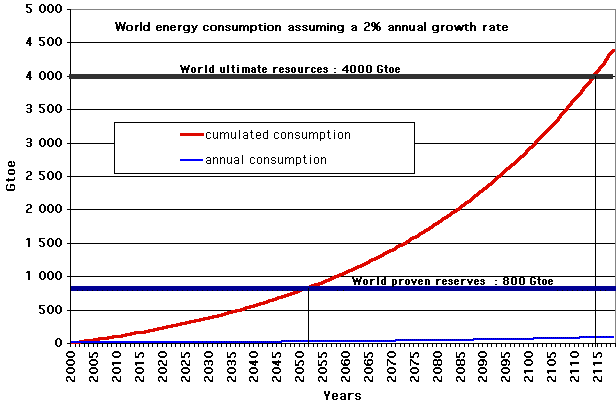 Annual consumption, and cumulated consumption, starting from 2000, with the hypothesis of a 2% annual growth rate of he consumption, in billion tonnes oil equivalent. As long as adopting the “american way of life” remains the objective for any country in the world, prolongating such a growth rate does not seem an hypothesis more absurd than anything else : theorically, if any inhabitant of the world (if we prolongate the trends there will be around 9 billion poeple on earth during the second half of the 21st century) consumes what an average American uses today (7 to 8 tonnes oil equivalent per year), the world consumption would soar to 63 Gtoe per year, a figure which is reached in 2100 in the above simulation. If the annual growth reaches 3%, what is closer to the observed growth rate – all energies included – since the Second World War, we then need only 43 years to consume all proven reserves (when the red curve below crosses 800) and 90 years to burn all ultimate reserves (when the red curve below crosses 4000). 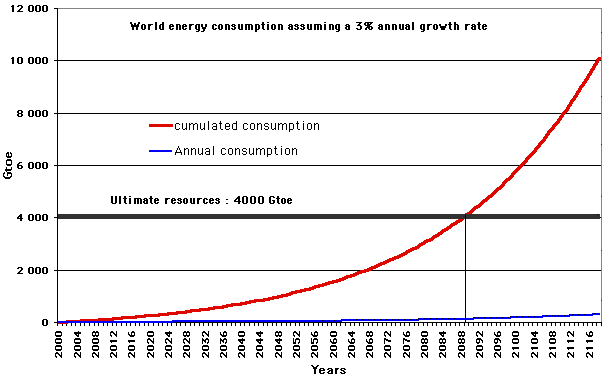 Annual consumption, and cumulated consumption, starting from 2000, with the hypothesis of a 3% annual growth rate of he consumption, in billion tonnes oil equivalent. 63 Gtoe per year would be reached as soon as 2066. Furthermore, a quick calculation shows that if we burn 4.000 Gtoe of fossile fuels in a century or so, we will have sent roughly 4.000 Gt (giga tonnes = billion tonnes) of carbon in the atmosphere (under the form of CO2), that, in the same time, will have eliminated a couple of hundred Gt only (today the sinks absorb 3 Gt per year). If we suppose (beware : I do not have any evidence allowing to consider that this hypothesis is more probable than any other, it is just a plausible case) that sinks can absorb 5 or 6 Gt per year at most, we will be over 2000 ppmv of CO2 in the air in 2100, or twice the concentration reached in the most pessimistic scenario now used by the IPCC. If we manage to sequestrate half the CO2 emissions (very optimistic hypothesis), we still reach the CO2 concentration of the most pessimistic IPCC scenario. If, in 2100, sinks have become sources, it is the black box as far as the ultimate CO2 concentration will be. but not enough remains to be sure that we will still have abundant energy to face the consequences of possible catastrophas in several decades (for example rebuilding the housing and the infrastructures for a billion men if massive migrations occur) : with a growth rate of 3% per year, there is not a drop of oil, not a liter of gas, and not a spoonful of coal left in 2080. An additional conclusion can be reached : “business as usual” scenarios, prolongating the present trends for more than 50 years, are probably the only ones that can be ruled out as irrealistic !